A view of St. John’s Cemetery by Alexander Jackson Davis, ca. 1860 (NYC Parks & Recreation). 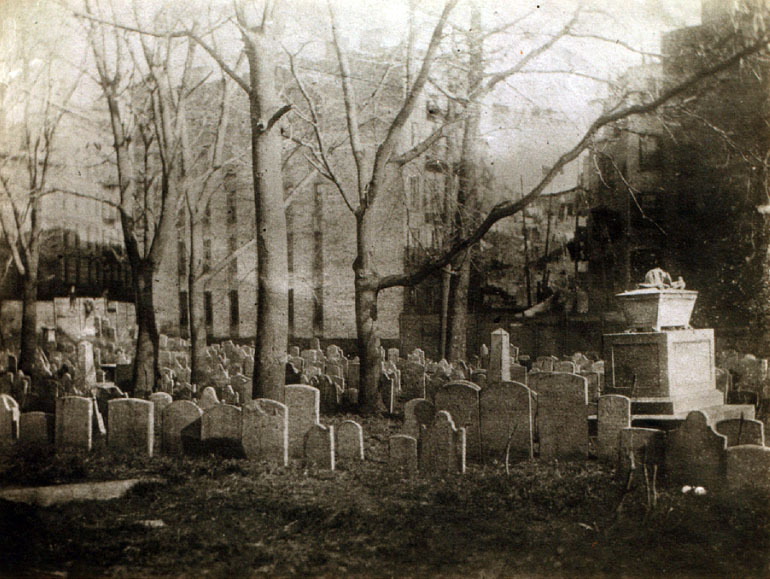 In 1890, the City of New York selected St. John’s Cemetery, located on the east side of Hudson Street between Clarkson and Leroy Streets in Greenwich Village, as a site for a new public park. 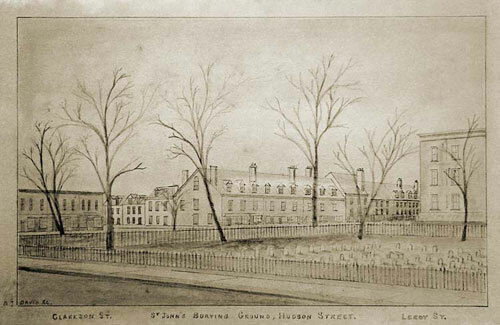 The property, which was connected with St. John’s Chapel of Trinity Church, served as a burial ground from 1806 to 1852 and an estimated 10,000 individuals were buried there. Following a five-year legal battle with Trinity, the city secured the property under the Small Parks Act, a law passed by the state legislature in 1887 that allowed the city to acquire property for the creation of small parks in crowded neighborhoods. 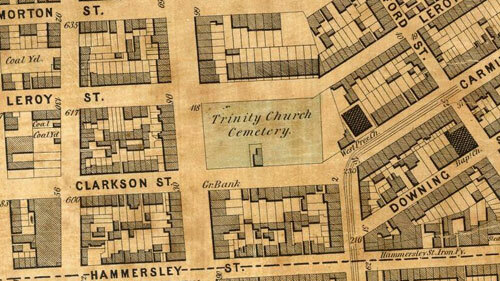 St. John’s Cemetery served as a burial ground primarily for the poorer and middle classes, although some prominent individuals and members of well-known families, such as the Schermerhorns, Berrians, Leggetts, and Valentines, were also buried there. The cemetery had been in a dilapidated condition for many years by the time it was taken by the city in 1895, but in the first half of the 19th century it was said to be a pleasant, restful place, and Edgar Allan Poe reportedly roamed the burying ground when he lived nearby in the 1830s. Helen Jewett, a prostitute whose 1836 murder became a media sensation, was briefly interred at St. John’s Cemetery; four nights after her burial, medical students stole, and subsequently dissected, her body. When Trinity lost the battle to keep the cemetery property, their attorney stated, “We did not believe the city could take such property for parks, but the courts have decided otherwise, and if the city takes the ground it takes the remains also, and must make its own disposition of them.” In 1896, the city announced that families wishing to remove relatives interred in the cemetery must do so by the end of that year; remains from only about 250 graves were removed before construction on the new park began in 1897. In 1898, the new Hudson Park (renamed James J. Walker Park in 1947), opened on the site. Remains beneath the park have occasionally been unearthed during construction work, as in 1939 when workmen encountered the coffin of six-year-old Mary Elizabeth Tisdall, who died in 1850. 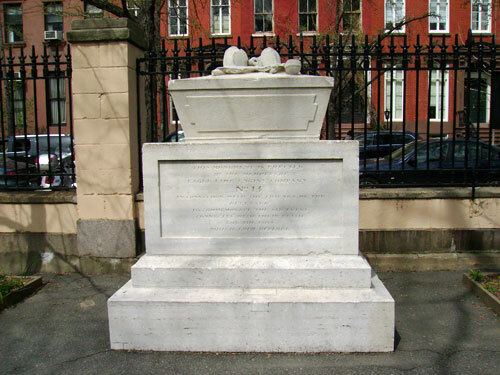 One reminder of the old burying ground still exists – an 1834 monument to fallen firemen, one of the most prominent markers in the old cemetery, was preserved during the original construction of the park, and stands today along its north side. Sources: Dripps’ 1852 Map of the City of New-York extending northward to Fiftieth St; Before They Were Parks (NYC Parks & Recreation); Walks in Our Churchyards (J.F. Mines 1896), 152-164; Literary New York (Hemstreet 1903), 148; The Murder of Helen Jewett (Cohen 1998), 299; Report of the Tenement House Committee…Jan. 17, 1895, 42-43; “What Will Become of These Bodies?,” New York Herald, March 20, 1893, 4; “Old St. John’s Cemetery,” New York Times Sept 13, 1896; The Mummy in Trinity Church (The Archivists Mailbag).